Black holes are the strong, silent type — an age-old enigma. Hubble estimates that there are roughly 100 million black holes in our galaxy alone, but because their gravitational pull is so intense, light can’t escape. So even with the most advanced equipment,“stray” black holes wandering in space are nearly impossible to find. But new research from a team of scientists at Keio University in Japan could be a game-changer in the hunt for these elusive giants. Initially, the group set out to observe the molecular gas around a supernova remnant called W44, located 10,000 lightyears away from our solar system. However, after using the ASTE Telescope in Chile and the 45-m Radio Telescope at the Nobeyama Radio Observatory in Japan, the researchers found strange motion within that molecular cloud, which they nicknamed the “Bullet,” since it was moving at 223,694 miles per hour. The team posited a hidden black hole could be causing this unusual activity, and decided to study the matter further. Their findings were published in January in Astrophysical Journal Letters. 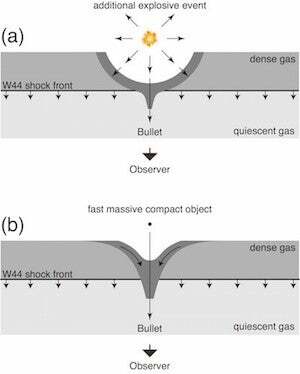 The team suggested that one of two scenarios could have caused the Bullet: an “explosion model” or an “irruption model.” In the first scenario, dense gas close to the black hole triggers an explosion, accelerating gas towards us. In the second, the black hole gives rise to fast-moving stream of gas. The group isn’t yet sure which of the two possibilities is more likely, but will investigate the situation further using the Atacama Large Millimeter/submillimeter Array (ALMA) in Chile. The researchers hope that their method, of studying motions inside gas clouds, will help reveal more black holes, because these tricksters won’t reveal themselves. In January, scientists at the universities of Durham and Southampton found hidden “monster black holes” at the centre of galaxies near our own Milky Way, shrouded behind clouds of gas and dust. Perhaps the Keio University method will help us find some of these sneaky beasts, and other smaller black holes in our galaxy, too.